How does your garden FLOW? Many beginner gardeners struggle when trying to create unity and flow in their existing garden. One of the most common problems I see is the lack of connection from one part of the garden to another. For example: These are my foundation shrubs. Over here are my roses. This area is where I plant my annuals. But, to create flow and unity in your landscape, you need to learn how to guide a person’s eye from one garden area to another. How can you connect these areas? What are the best ways to draw into your garden? Or from your foundation plantings over to your roses? How can you peak their curiosity and sense of wonder? Here are some easy ways to begin creating unity and flow in your landscape. You can use curved lines in your hardscaping or in your garden bed edges to create a better flow and unity in your garden. Curves can do a few things. First, they create continuity between your different garden areas, or garden “rooms” as I like to call them. If you have a shade garden on the side of your house and a sunny spot in the front, try adding a curve that wraps around the edge of your house and “combine” the two beds together. This is a great way to begin uniting the different garden beds you’re designing. Second, curved lines add a sense of depth to your garden. When the curves “pinch in” it can create little nook in your garden. A viewer from a particular angle may not be able to see what’s in the nook, so it will help to lead them deeper into your garden. When a curved line “bows out” it’s a great place to add a focal point of attention that will make them want to take a closer look. In addition, the bow is going to hide the areas of the garden that are “around the bend,” creating more mystery in your garden. This will peak the viewer’s curiosity; they’ll want to see what’s around the corner. Quick Tip: My post on Landscape Layering is really helpful in understanding how to build up your garden beds, first. And, if you’re new to garden design, I’d also recommend checking out these beginner landscaping tips for getting started. Repetition of elements throughout the landscape is another great way to create unity in your landscape. You can repeat a plant, a color, a texture, a shape or even a material (like wood, stone or glass). Repetition creates flow from one area of your garden to another. One way to use repetition in your landscape is to add the same element over and over in different areas of your garden. This helps a viewer’s eye to bounce from one garden to the next. Another way to use repetition is by repeating elements in groups. Adding a group of the same plant, the same color but different plants, or the same planting scheme creates a sense of proximity. It also increases harmony and unity in your landscape design. This can be achieved through drifts. Basically, drifts are when you group plants or a series of plants together in a bunch. Usually, drifts are created in odd numbers like 3, 5 or 7. Drifts of plants are a great way to move a person’s eye around your garden. You can plant your drift groups from left to right, then repeat this grouping in different area of your garden. Or, you can plant your drifts front to back within the garden bed, then repeat in other areas. 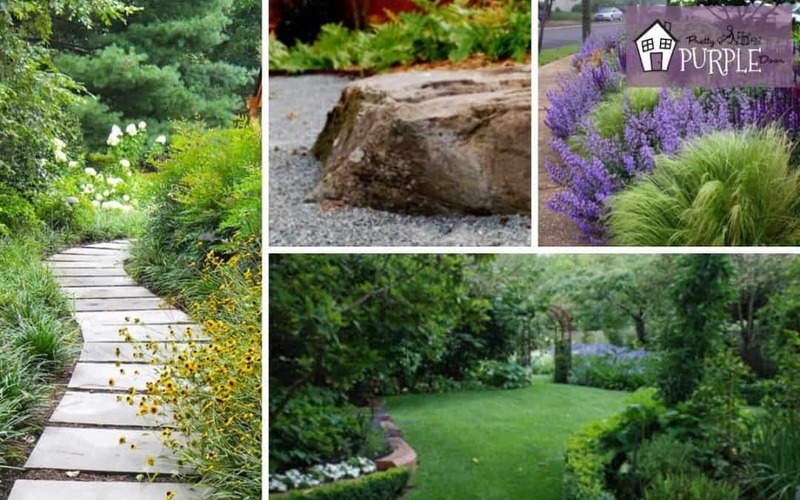 If you plant front to back, you’ll not only create unity in your landscape design, but can lead a person’s eye deeper into the layers of your garden. Quick Tip: To learn more about repetition in the garden, check out my posts about creating color schemes and using plant texture in your garden design. 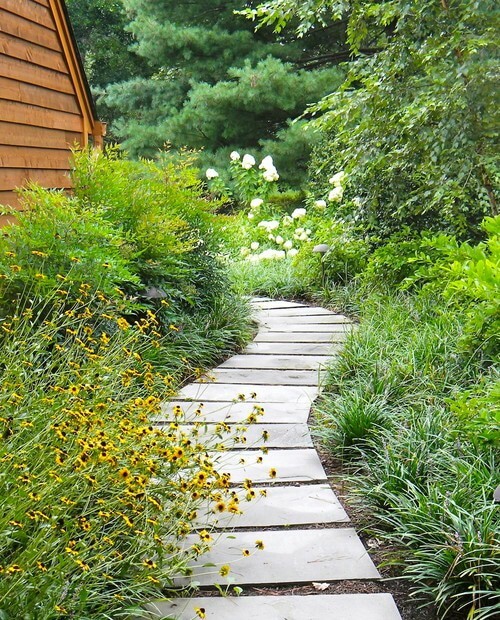 Creating paths is another great way to create a sense of flow and unity between the different areas of your garden. A path can mean a literal walking path made of grass, brick, stone, mulch, gravel or anything else you can think of. A path can also be a bit more abstract; like a mass planting of groundcover that flows from one part of your garden to another. Or a dry river bed. Or a flowing stream. Creating a connection between the spaces of your garden using a path visually moves the viewer’s eye through your landscape. Quick tip: Check out my Garden Paths and Walkways board on Pinterest to get some creative inspiration and garden path ideas you can try at home. Focal points are another great trick to create a sense of flow in your landscape. This sounds counter-intuitive, because essentially focal points create a “stop” and interrupt the flow. But, what focal points also do is naturally create a space to introduce a transition in your garden from one area to another. Focal points can be bold to create a dramatic statement. They can also be a bit more subtle. Let’s go over examples of both bold and subtle focal points to get a better understanding of this concept. An example of a bold focal point is a gate. Gates can be aesthetically useful if your garden feels too “predictable.” The gate will create interest and a sense of curiosity in the viewer. I wonder what’s beyond there? So, if you have two distinct garden spaces that you’re having trouble “connecting,” perhaps you should try a gate to stop them in their tracks. It’s a great way to create unity between two very different spaces. Focal points can be a bit more subtle, too. Adding a subtle focal point along a pathway where your garden naturally “bows out” adds unexpected interest to your garden. It also creates a natural transition point between two different areas of your garden that don’t seem like they belong together. For example, adding a large boulder or even a large planter pot will naturally lead a person to that area of your garden. They will likely stop to look at the vignette you’ve created, then be able to move forward into a different area of your garden without the jarring transition. If you think of your garden as a paragraph, a focal point is the punctuation at the end of each sentence. It will create a stopping point, but the same “thought” can continue in the next sentence as you finish reading the paragraph. Whether you want to create a subtle or bold statement with your focal points, it’s an opportunity to add something unique and unexpected to your garden. Focal points are the chance to give your garden some serious personality while creating a smooth transition and increased flow in your landscape. Quick Tip: If you want to learn more about focal points, you may want to purchase my Focal Points ebook. It will teach you how to position focal points within your garden. There’s also a lot more give you a lot more ideas and examples to try in your own garden! 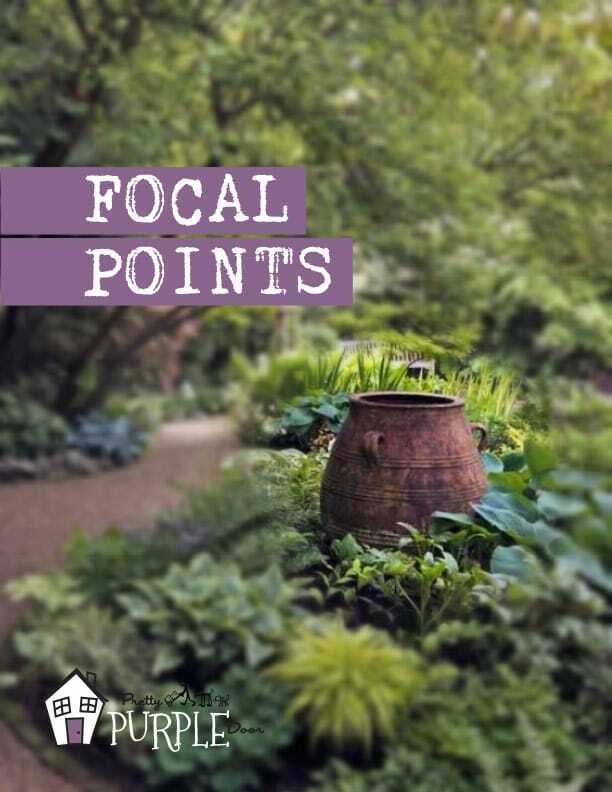 My Focal Points Ebook will teach you how to position focal points in your garden and is filled with helpful examples to get you started. Try adding vines, an arbor, an interesting tree or another tall element near the back of your garden that plays off the colors or other materials you are using within your garden beds. Why does this work, exactly? When you create focus that’s higher off the ground than your other plantings, it will get a lot of attention. 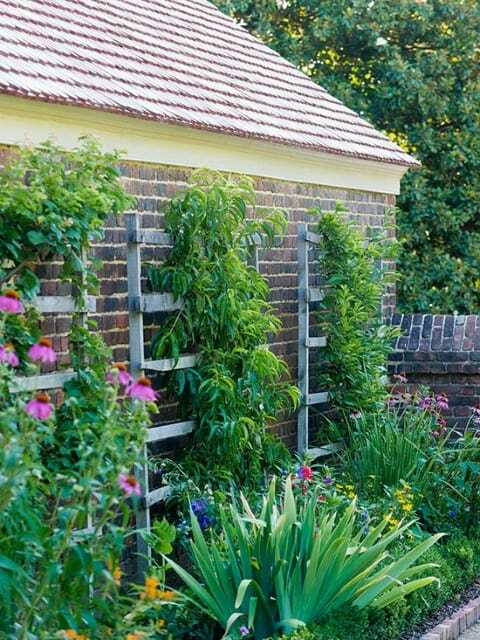 That’s because vertical elements can be seen from many different angles and areas of your garden. So, if you are lacking time or budget, I’d recommend trying this trick first. Vertical elements are workhorses when uniting your space. Remember, tying in your vertical element with a color, texture or material you are using in other areas of your garden is important. It’s one of the quickest and easiest ways to create unity and flow across your entire landscape. Adding a vertical element is one of the fastest and easiest ways to improve the flow in your garden. But, make sure that it ties in with the other colors and elements in your garden. Whether you’re a beginner or a seasoned gardener, try to think about your garden as a whole. Work on uniting your spaces. Creating better flow will take your landscape from predictable to unique and curiosity-provoking.